Old fortress is the first thing someone is seeing when coming to Corfu by boat. It stands on the eastern side of the town, on a rocky peninsula that gets into the sea. It is is an old Venetian fortress built on an artificial islet with fortifications surrounding its entire perimeter. 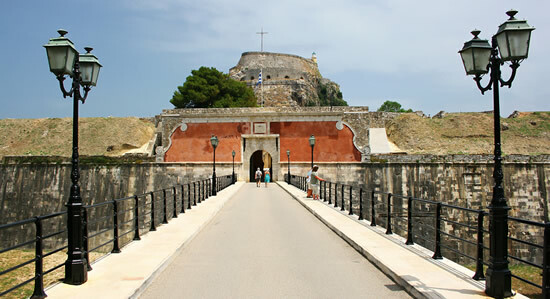 As it is surrounded by the sea, the fortress was in fact used both to defend Corfu town, and to check the near coast. To get in you just have to cross the bridge that links the fortress with the town of Corfu. Under the bridge there is a large ditch that divides Corfu and the fortress which is used today as a docked for fishing boats. Near the bridge the statue in honour of Commander Schulenburg was built by Venetian to remember the battle against Turkish. Entering the fortress a hallway leads to the higher part of the Old fortress. At the end of the hallway there’s also a small path that conduces to the ancient barracks, while along the south side of the hill you can visit the little church of St. George. This little church was built in 1840 by English and later has been adorned with icons coming from St. Spyridon church. Into the Old fortress there are numerous buildings and some of them has been used to create the Cafe and Restaurant of the Old fortress open all day for the visitors of the fortress providing a magnificent view to the Garitsa coast while enjoying their coffee or lunch. Near the principal gate there’s the historical archive, that gather up more than 6 centuries of Corfu history. Apart from the historical and cultural point of view, the Old Fortress offers also a stunning view overlooking the town of Corfu and the Ionian sea between the island and the mainland, a unique sight for photo-shooting. Transfers Corfu provides a tour to Old fortress in combination to other places or just with a tour to the Old Corfu town center which is situated just in front of the entrance of the fortress.